Don Quixote would have had his work cut out in Saxony-Anhalt: the majestic "windmills" can be seen all over the federal state. They are the symbol of a flourishing economic sector: renewable energy. Around half of the energy generated in the German federal state comes from renewable sources, and what was once a niche sector has long since become something far bigger. GETEC green energy AG has played a major role in this success story – even though it otherwise appears to be a small company with just 20 employees. "The GETEC Group recognised the sign of the times," attests Frank Busch, Managing Director of ATI GmbH Anhalt. Busch previously managed the Cluster for Renewable Energy Saxony-Anhalt (CESSA), an association for small and medium sized companies that lasted from 2008 to 2014. As a broadly-based company group in the energy sector that was established in Magdeburg in 1993, GETEC soon turned to renewable sources of energy. An independent area of business surrounding the production, storage and use of regenerative energies soon developed. Combining these activities in a single company was the logical result. Board Spokesman Chris Döhring tells us that the company GETEC green energy AG was established in October 2010. The company focuses on different energy carriers. In 2014, five bio-refineries connected to the power grid. A wind park is currently being built at the former military airport in Zerbst. Along with a biorefinery this is also home to one of the biggest solar parks in Germany. "With the Zerbst Energy Park, GETEC green energy AG is focusing on a comprehensive concept for generating energy from biomass, wind and solar power," emphasizes Chris Döhring. The companies affiliated in CEESA cover the areas of near-surface geothermal energy, as represented by the company BLZ Geotechnik Service GmbH, explains Frank Busch, providing an overview of the structure in Saxony-Anhalt. In the area of photovoltaics Saxony-Anhalt is primarily home to service providers who have retained their market presence despite the collapse of the manufacturer Q-Cells in Bitterfeld. Together with the Otto-von-Guericke University, companies, and another CEESA Manager, Prof. Dr. eng. Zbigniew A. Styczynski, have researched the design and configuration of power networks. And the use of biomass has become an additional mainstay for many farmers. Chris Döring's company offers location and concept development, planning, realisation, marketing and operational management as well as financing and the procurement of subsidies from one single source. At the same time, GETEC green energy AG prioritises links with regionally located companies. The company profile also includes the search for new solutions. Together with partners from the region, for instance, GETEC green energy has developed a process for pressure washing in which it is an international leader. 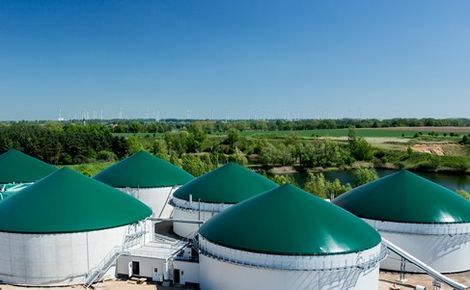 With this process, biogas is processed into natural gas equivalent biomethane. "Since we had already built some large biorefineries, this research was the next logical step forwards. And it was largely possible with our team's experience and know-how," explains Board Spokesman Döhring with pride. He is less satisfied with some of the framework conditions regarding the amendment to the Renewable Energy Law, however. And yet despite all of the uncertainties he remains optimistic: "Renewable energies are still a hot topic. Towns, cities and communities are focusing increasingly on renewable energies and energy efficiency, and frequently on ensuring a completely self-sufficient energy supply. Not only is there considerable potential for this in Saxony-Anhalt. We have made this area of business our key focus and are offering municipalities in particular sophisticated and comprehensive concepts which are sustainable and pay dividends at the same time."